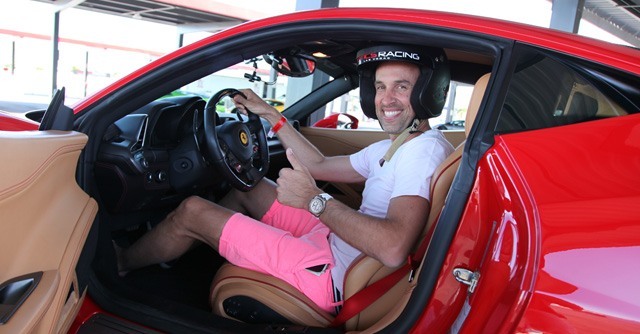 You cannot leave Las Vegas without driving a supercar at speed on a real racetrack. With multi-car packages and ride-along experiences to choose from, the possibilities are endless. Whether you're looking to celebrate a bachelor party or just have fun with a group of friends, our experience is the perfect platform to help you develop a killer event everyone will enjoy! From Driving Experiences and Ride-Along to fun challenges, this is what a bachelor party is supposed to be! And we are the expert planners to assist you to organize an epic party that your guest will talk about forever. 14,000 sq. Diving Center including a private lounge, exclusive catering and a personalized experience on every detail, Exotics Racing can create the ambiance you want for your guests. The experience you always dreamed of! Exotics Racing offers a once-in-a-lifetime activity for groups of all sizes. Select our pre-built package for small groups, or allow our team to create a customized itinerary that includes friendly and safe driving experiences, fun thrill rides with our professional drivers, outstanding hospitality, and unique take-away gifts. 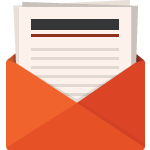 Our specialists can create an exciting turn-key event program for you that can in­clude VIP access, catering, transportation, photo booth and more. Great for bachelor party, birthday party or any celebration, all are welcome and no experience or special gear is required. Give your guests the experience of a lifetime! Get your group behind the wheel of one of our 60 supercars as the driver in this high-speed experience. After a technical briefing and 2 track Discovery Laps, they’ll head to the track to drive their sessions with a professional instructor and join the select few who can say they’ve driven the world’s best supercars! Voted the best thrill ride in Las Vegas. 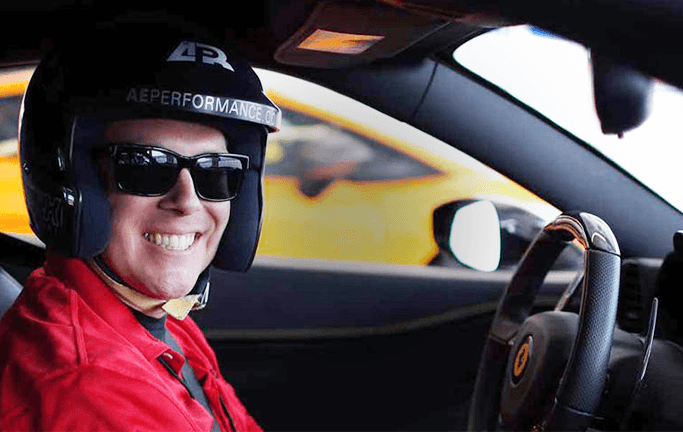 Ride along as a passenger while a professional racer takes you for the Supercar full-speed experience. Drifting is available with the Dodge Charger SRT Hellcat for those who want their adrenaline pumped! In addition to our classic daytime programs, Exotics Racing can create a special after-hours event for your group. With in-ground track lighting and amazing trackside space, driving under the stars is the perfect program to host a private party. Explore the beautiful surroundings of Las Vegas in style behind the wheel of our exclusive supercars. Drive on unique roads with a private instructor who will guide you and your guests through this unforgettable adventure with a digital map and radio. Customize your itinerary with us; from driving up the famous Las Vegas Strip to high elevated curvy roads through the Canyons, you will experience the supercar tour at its best! This exclusive arrive-and-drive racing program provides unique group experiences to suit all skill levels. 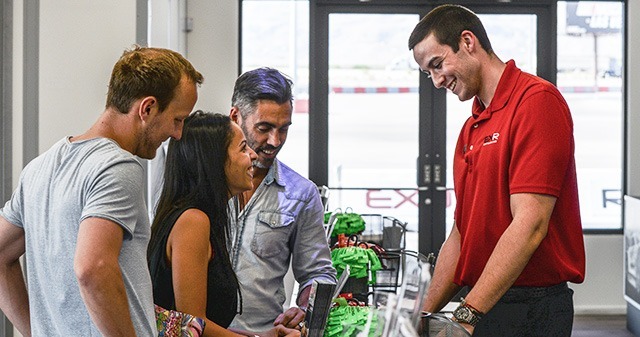 Allow our specialists to design a customized racing itinerary for your group that includes friendly and safe side-by-side competition in fully branded EXR LV02 racecars at incredible racetracks and with professional coaching. Options are unlimited with the EXR Series for those who always dreamed of being a real racing driver! Challenge your team with our fun and thrilling activities and upgrade your event with unique add-ons. 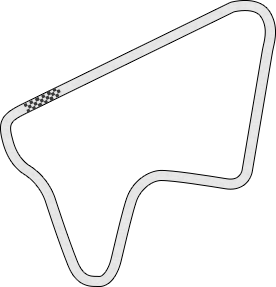 Mini Challenge. Competition done right. Harness your group’s competitive spirit with a relay race on our specially designed slalom course. Teams of two must balance speed and precision as they battle to the top of the leaderboard in a Mini Cooper S. Perfect to build-up team spirit! Build your skills. Build your team. The pit stop challenge sets two-person teams against the clock in a race to the fastest tire change. Using an EXR LV02 racecar, how fast can individual team members change a tire using a professional wheel gun in a head-to-head pit-stop challenge? Another fun and adrenaline-filled exercise, is the “Batak Challenge”. Used by premier athletes around the world, including many Formula 1 drivers, the Batak Challenge is a test of hand-eye coordination and reflexes. Voted the best thrill ride in Las Vegas! Ride along as a passenger while a professional racer takes you for the Supercar full-speed experience. Drifting is available with the Corvette Z06. Perfect for kids and guests. Let us worry about the details, from our own shuttle to our partnership with limousine and helicopter companies; allow our team to create a seamless experience for your group. Complimentary shuttles are also available. Offer your guest the opportunity to treasure their experience forever. The cameras capture the view out the front of the car and all the fun happening inside the car with telemetry that shows your speed, location on track and best lap time. Our event team is at your disposal to customize an event for you and take care of all your needs in creating an exceptional experience. We offer many branding options including vinyl logos on our supercars and the screens throughout the facility. Exotics Racing’s partnership with Levy Restaurants will impress your clients with delicious, quality food expertly presented. Whether you’re looking for something healthy or a little more decadent, our menus have something for every need. Our team is at your disposal to tailor the event how you imagine it. Every request is considered and we can suggest you extra options such as a champagne bar, photo booth, videographer, DJ or trophies for your team. Options are unlimited. 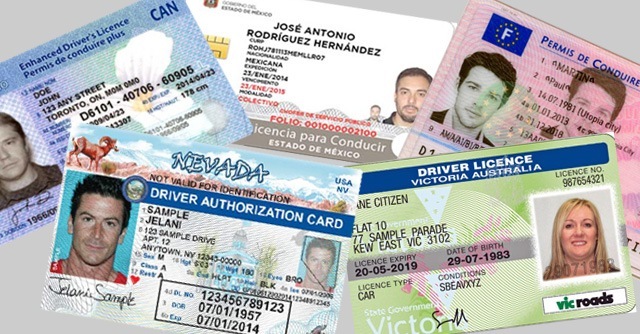 This package is perfectly designed for small group and bachelor party of 5 drivers minimum. 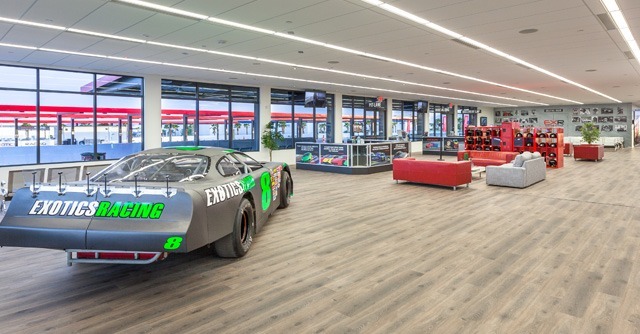 With customizable venues, Exotics Racing can provide services to any size group in various space formats to create the best flow to your event. 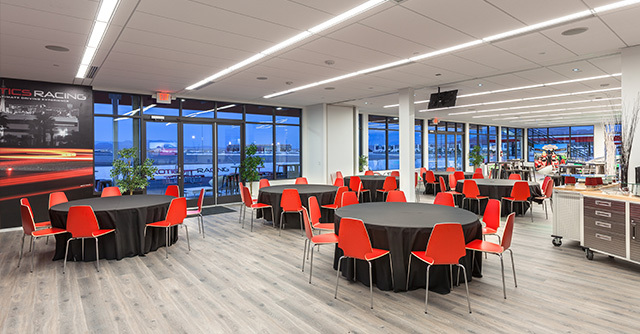 The trackside Paddock Club is a flexible space that can be configured to meet the needs of up to 400 guests. The high-end facilities include: modern design, viewing deck overlooking the track, café, air-conditioned, lounge music and Wi-fi. Our Las Vegas track is transformed at night with in-ground lighting that adds another level to the supercar driving experience. All vehicles are equipped with headlights so visibility is uncompromised, and the revving of supercar engines after dark provides an unmistakable soundtrack for those mingling inside our comfortable trackside facility. Created by professional racing drivers, Exotics Racing has the best racing instructors who deliver professional coaching on track like nowhere else in the world. To maintain our level of expertise all of our instructor staff has a pro racing background and are trained by world renowned racing drivers. Exotics Racing is the original supercar experience since 2009 and offers a commitment to excellence that is unrivaled, offering the highest level of safety and service in the industry. Our locations are the only purpose built tracks equipped with F1 TechPro barriers and FIA walls and are fully staffed with professional racing instructors, world class hosts, and certified fire& safety personnel. Private rooms are available that accommodate up to 400 participants. Event management services are also available. Get close access to the action from the comfort of our panoramic terraces. Your guests can mingle and enjoy food & beverages in between driving activities. Ride-Along & On-Board Video Don’t forget to schedule the adrenaline-pumping ride of their life! Depending on the size of your group, you can host your event in our private corporate room with customized catering. The interactive technical briefing will introduce your group of guests to our track and proper driving procedures that will make them more efficient and faster drivers. Later, they will be paired with an instructor who will help them to safely get the most out of their driving experience. 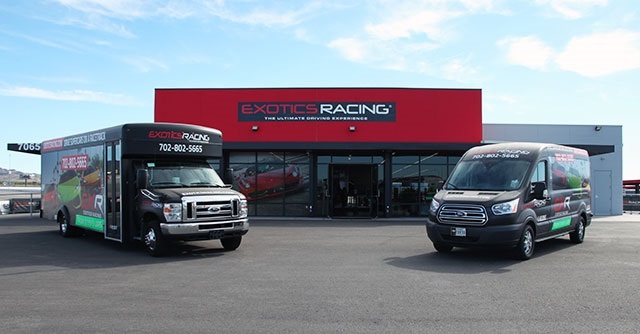 Exclusive and only at Exotics Racing, your guests will ride-along with one of our professional drivers behind the wheel in order to get a preview of our racetrack. The Discovery Laps are driven at moderate speed in order to explain each braking zone, apex, and acceleration zone. During this session, they will become familiar with the racetrack as well as how your body will react to the turns. Get behind the wheel of a powerful supercar on our racetrack! 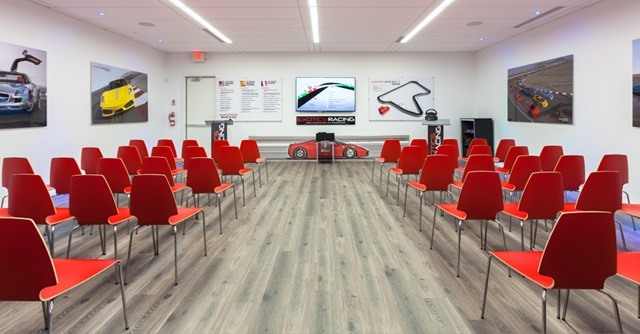 The personal racing instructors will help your guests to get the absolute most out of their driving experience. 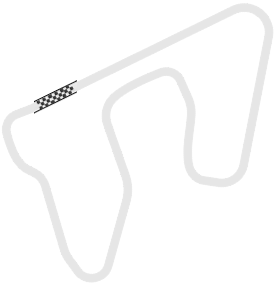 The length of their sessions will vary depending on how many cars or laps they are doing. After their driving experiences, don’t forget to schedule the ride-along experience for your group; this will be the adrenaline-pumping ride of their life! It is also the perfect experience for guest who may not want to drive. At the end of the event, guests will receive a Certificate of Achievement. 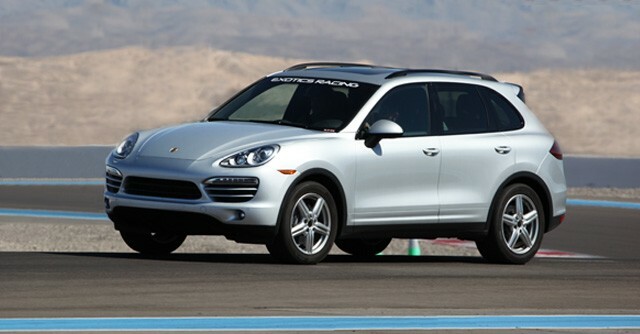 The HD video of their driving experience is a great enhancement to any package. Why choose Exotic Racing, the best driving experience in America? With a selection of Ferraris, Lamborghinis, McLarens, Porsches and many others, we offer more cars and racecars to choose from than any other driving experience. Choosing Exotics Racing is easy. Choosing which car to drive first, not so much. 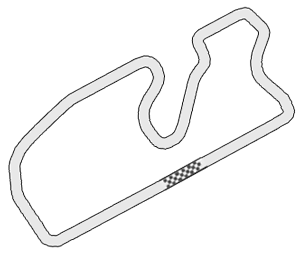 Our exclusive racetracks are specifically designed for our supercar driving experiences & racing school programs. Our safety record is the best in the industry. Large runoff areas and TecPro safety barriers match the standards set by Formula 1. In 2005, we created the world’s first supercar driving experience in Europe. Since then, Exotics Racing has become the number 1 driving experience worldwide. Many have tried to copy us, but we remain the leader of the pack. Don’t settle for less, drive the original. Among our competition, we are the most highly rated supercar driving experience. Our commitment to high quality service, fun and safety is unparalleled. As a result, we’ve won multiple Best of Las Vegas and TripAdvisor awards over the past several years. There is a reason why Lebron James, Michelle Rodriguez, Mario Andretti, Kyle Busch, DJ Tiesto, Jay Leno, Eli Tomac, Chuck Liddell, Caitlyn Jenner, and many more choose us as their destination of choice: there is nothing like Exotics racing! Overseen by a team of friendly racing experts, we have the best racing instructors and racecar drivers who deliver an unrivaled driving experience and organize the best arrive-and-drive spec race series in the United States of America.  Our exclusive racetracks are located on the legendary Las Vegas Motor Speedway and Autoclub Speedway in Los Angeles that host the NASCAR, INDYCAR, EXR Series and NHRA Drag races.